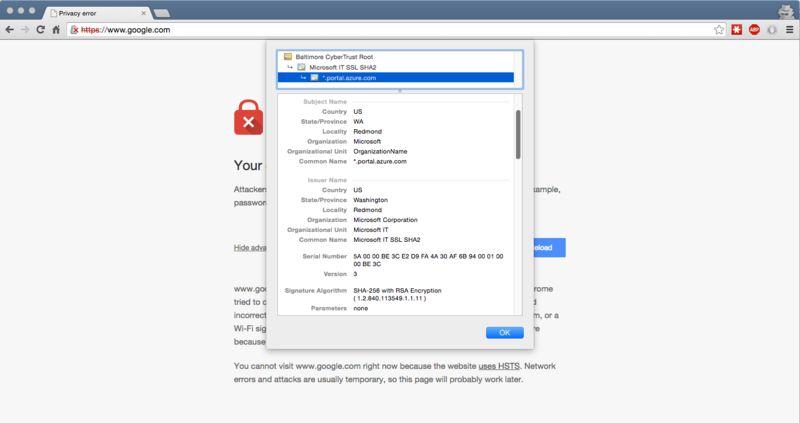 Google.com serving *.portal.azure.com SSL certificate? Just ran across this in my own browser (Chrome, Mac OS) where going to google.com would serve a *.portal.azure.com certificate. It seemed to be signed all the way to the root too. This disappeared after 60-100 seconds. What is the most likely cause for something like this? Browse other questions tagged tls google azure or ask your own question. How insecure is it to use the same private key for multiple x509 certificates?